Today I am the same gestational age in this pregnancy as when Gabriel died last year. It is a day of mixed emotions for me I'm sad and hopeful. I miss my first born and even though it has been a year, the pain of loosing him is still there. I am also happy that this pregnancy has been different, so far everything is going wonderfully and the baby is doing fine, still has amniotic fluid and nothing is wrong. 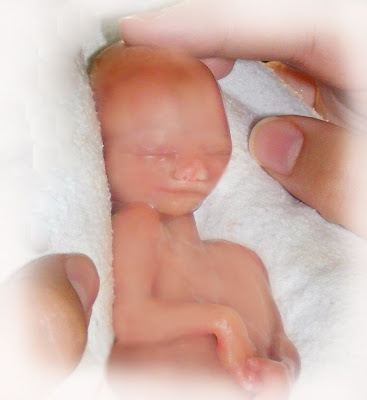 One interesting thing about being in my particular situation is that I know exactly what a 16 week old fetus looks like. I delivered my little Gabriel and then we were able to hold him and say our goodbyes in our own time. I can picture exactly what this baby in my tummy looks like now and would feel like right now. When Gabriel was born he was 8 inches from head to feet, his little hands and feet were perfect and he even had well formed nails on each of his tiny digits. I know what it felt like to have his tiny hand curl around mine. You could see his Jeremy and I both in his face. He was a perfectly formed tiny human being. I'm trying to focus on the positive today and even as I miss my first little boy I am trying to remember the joy he brought me. I've been loving Teddy Graham with everything I have since the moment I found out I was pregnant and will continue let my love grow and to cherish every second because I know just how precious the life that I am carrying is. You are such a wonderfully caring person. I am praying for little teddy graham and can't believe how big he(?) is getting. You are currently in possession of one of the biggest miracles on earth and I am glad it is going well. To our first born son. Gone but never ever forgotten! (raises glass of root beer in a toast to absent family) We'll see him again one day, but it can still be hard some times. Teddy Graham is awesome and I can't wait to see him live and in person!